Family Owned and Operated Boutique Learn to Swim Centre. Located in Frankston South, Victoria. We have the perfect environment for your child to learn how to swim: small classes, warm water, brilliant teachers and a clean, private indoor facility which is heated throughout the year. New Wave Swim School specialises in teaching swimming to babies through to squad. If it's your first time in the water or you need that extra few seconds to outperform your competition, we have the answers! Learn to swim classes are available for babies, pre-school children, primary school children and squad training. All our staff are fully trained Austswim Level 1 Certified Coaches. Our staff also have Working With Children Certificates and are First Aid trained every 12 months. We pride ourselves on a friendly and professional atmosphere built on a reputation which is second to none. Our crystal clear pool gives every child the opportunity to learn swimming in a safe, calm and relaxing environment. New Wave Swim School is a purpose built boutique facility which has been operating for over 20 years. In the last 20 years fantastic relationships with students, teachers and parents have been formed - these relationships have helped build a brilliant culture that thrives today. In January 2016, 3 time Olympic Medallist in Swimming Andrew Lauterstein purchased New Wave Swim School and continues to maintain the core principles of safety, family and fun. Our swimming classes not only teach children vital swimming skills, but also instil a positive can do attitude that will stay with them for life. By developing friendships with both the parents and children, New Wave Swim School has a relaxed and enjoyable feel. This helps to attract and retain the best swim teachers and give children the consistency that they need. 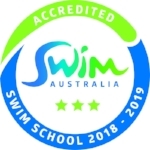 New Wave Swim School is a registered Swim Australia Learn To Swim School. Pre-Schoolers a maximum of 4 to 1 child to teacher ratio. School age children a maximum of 5 to 1 child to teacher ratio, and often 3 teachers for up to 10 children. Excellent child to teacher ratios allow all our students to develop strong relationships with their teachers and to receive personalised attention. Highly skilled and qualified swimming teachers, whose energetic and passionate approach enables each child to obtain outstanding results. 32 degrees in summer and 34 degrees in winter. Crystal clear, back-washed twice a day and tested 4 times a day. A refreshing, healthy and hygienic swim environment. Get in touch via phone (03) 9775-2235 or email info@newwaveswim.com.au to book your assesment today. Any questions you may have in regards to our swim school (including pricing) are likely to be answered on our NEW STUDENT INFO or FAQS pages. If you have any questions which are not covered there please do not hesitate to contact us as we are always very happy to assist. Please contact us via the form below in order to arrange your assessment. We will get back to you as soon as possible. If you would like to enquire about baby or pre-school age classes please get in contact via the form below and we will be happy to arrange your free trial lesson. We’d love to hear from you! If you have any enquiries about enrolling your child at New Wave, arranging a assessment or any other general questions please get in touch via the form below. Thank you for your enquiry about swimming lessons at New Wave Swim School.